No relation to "The Voidsteppers", the popular Void-based dance troupe. Only 1 attack? Look at all those muscles! Love the new animation! Those purple colours on his back! The new golden animation is great! just noticed it! agreed the purple thing is incredible. Sad Hearthpwn hasn't updated it yet. This is still one of the best 1 drops, (class specific or neutral), in HearthStone. 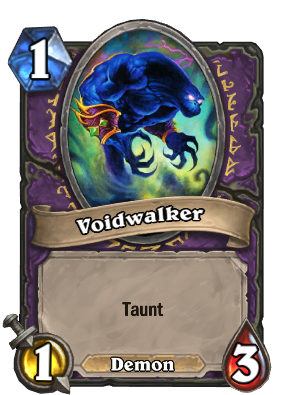 Even later in the game, the face that it's a Demon, has 3 Health, Taunts, and costs only 1 Mana can make it relevant... especially paired with Mal'Ganis. This supposedly Anti-Aggro Tool exist in every single Zoo deck and like no Demon control deck. EVERY none buffed 1 drop does. Wait, actually, was there that 1 cost 0/4 taunt or was that a 2 cost? Has one more hit point than Goldshire Footman, the equivalent neutral card, and is a Demon.